Fiddleheads are young ostrich ferns that show up in wet areas in early to mid-spring. The season usually lasts for a couple weeks. One day can be the difference between a young tightly curled fiddlehead and an unraveled fully grown frond. They are a wonderfully delicious gift of spring full of antioxidants, omega 3 and 6 fatty acids, iron and fibre. Some people relate their flavour to that of asparagus, I think they have a unique sweet, earthy quality to them. To me, fiddleheads taste like spring and are best prepared as simply as possible. I had the pleasure of collecting some last week to share at a fundraiser for the Our Sustenance program. I had the pleasure and honour of cooking freshly picked asparagus, peas, an assortment of herbs and wild edibles. Everything was prepared as simply as possible to showcase their natural deliciousness. When cooking with love and good technique the cook has the opportunity to help fully develop the flavours of each ingredient. When foraging for fiddleheads it is important to remember that they are a gift and gratitude should be expressed. To me that gratitude can be shown by not over-harvesting and leaving enough for the next person. This is so they can continue to thrive and nourish us now and for generations. Whenever I forage for sustenance I feel a responsibility to share the abundance of nature in a genuine way. This practice leads to collective sharing and learning, especially when someone tries something for the first time. It is another way to be engaged with food and the land we all share. First, learn to identify which ferns are safe to eat. If you are not sure, don’t eat it. There is a lot of information online to help you learn. Cleaning fiddleheads well is important because they grow in the wild. There is always the possibility that any number of things can come in contact with them that can make you sick. I always wash mine three times in generous amounts of water each time. Fill your sink, bowl or bucket with water, place them in the water so they have room to move around. Agitate them, this will help the paper like skin come off. 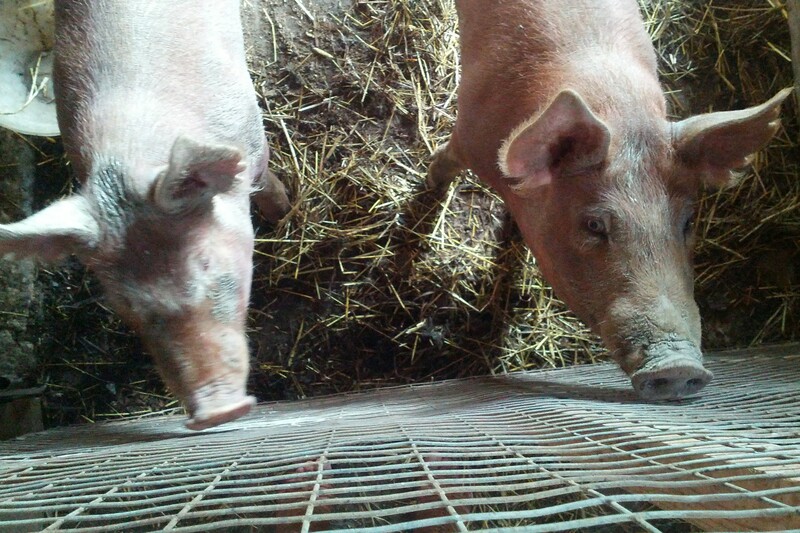 Let them sit undisturbed for several minutes. Any dirt or debris will sink to the bottom, the paper may float. Carefully remove from the water into another container. Fill generously with water and repeat. They are best stored in fresh, clean water. Some people will say to cook your fiddleheads for upwards of 15 minutes but I find that turns them to mush. I recommend boiling them for 3 minutes in salted water. Rinse and repeat in fresh water. Serve immediately or shock them in an ice bath. 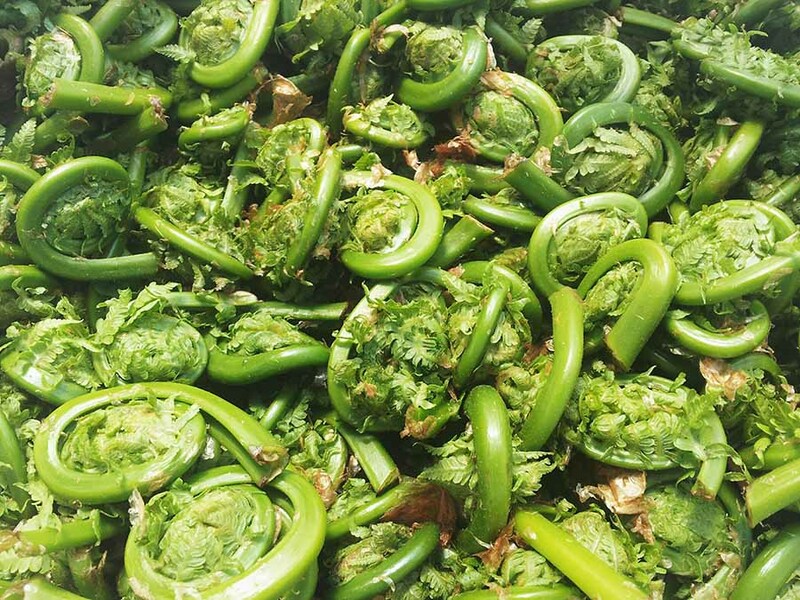 There are many ways to enjoy fiddleheads. Simply boiled and topped with butter and salt or sautéed in butter with garlic. They can also be served cooked and chilled in a salad or in a soup. 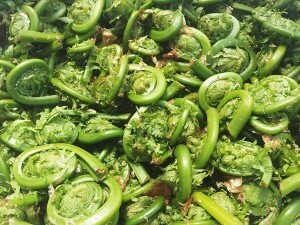 Fiddleheads also make a great addition to egg dishes like quiche or frittata.